Celebration fosters an abundant life by balancing our approach to life, refreshing our perspective of others, and restoring intimacy. Celebration enhances intimacy and culminates in a renewed vitality for life. Family meals are a great way to celebrate family. During your next meal, share your favorite family memories and stories. Children often love to hear stories of thier parents’ childhood. Have fun–laugh and celebrate your family. Who knows, the next time you tell stories you may talk about this meal! This weekend play a “game of note-leaving.” Leave notes of encouragement and love for your family members in the most creative and unusual places you can think of (but where they will still find it, of course). Have fun! Make something together–cook something special or make a craft. Enjoy your time creating something as a family. Encourage each family member to list 2-3 things they have a fun time doing with family. (If there are four people in your family, you will have a total family list of 8-12 activities) Do one of the activities listed tonight. Keep the list, pull out the calendar, and plan to do each one of the activities over the next couple months. “Man is flying too fast for a world that is round. Soon he will catch up with himself in a great rear end collision.”–James Thurber. Avoid a “great rear end collision” this weekend by slowing down while you enjoy celebrating family time together. Family dinner is a good way to celebrate. Make it really interesting tonight by eating dinner backwards. Start with dessert and end with the salad. Have fun and laugh together. Have a Family Thanksgiving Extravaganza. Each night share thanks with your family. Turn those thanks into a song, a poem, a craft, or anything else that would display your Thanksgiving Extravaganza. Two quotes from Stuart Brown, author of Play: How it Shapes the Brain, Opens the Imagination, and Invigorates the Soul point to the importance of celebration and play in the family. Play a game of “Creative Gratitude”-Everyone tries find the most creative way to show gratitude to other family members. While eating Thanksgiving dessert, your family can vote on who showed the most creative idea. Spend time with your family by having a tickle fest and pillow fight. Have a “technology free night.” Turn off the TVs, cell phones, computers, and video games. Then, sit down to enjoy a family game by candlelight. Share your favorite family stories. Ask your family to tell their favorite stories, too. You can share stories of your immediate family and stories of your own childhood. You can share funny moments, embarrassing moments, happy moments, or moments that made you proud. Encourage everyone to share their favorite family stories. As a family, make a collage of all the things that remind you of your family members. Cut out pictures that represent occupations, hobbies, or special things that remind you of all the people in the your family. Include images and ideas that represent your family identity. Build a snowman with your family and then come inside for a cup of hot chocolate. Spend the time celebrating your time together. Go out for dessert after a family member’s special event. This presents a time to encourage, compliment, share, and laugh. As a family, play a game–cards, board games, charades, etc. Create a photo album using pictures from a special event or holiday. As you do, share and relive your favorite memories. Create a memory jar by putting your favorite memories, scriptures, & family quotes on small pieces of paper. Put the papers in a jar. Add to it as often as you can. Then, once a week, pull out one slip for a time of celebrating and sharing your favorite memories. Make a copy of one of your favorite family photos, perhaps of a vacation or some fun activity. Blow the picture up, put it on cardstock, and make it into a puzzle. Come together as a family and put it together. Share a favorite family desert or snack. Enjoy preparing it together as well as lots of fun conversation and laughter while eating it. Do something or purchase something simple–make brownies, buy some candy, make a card, send a text, etc–to surprise your family. When you greet your family members upon returning home from school and work today, celebrate the “daily reunion” with a hug that lasts at least 6 seconds, eye contact, a smile, and a statement reflecting how glad you are that they are home. Celebrate Valentine’s Day as a family. Give each family member one card (home made or store bought) each day starting February 1st and ending February 14th. Give fun cards and serious cards. Make a Valentine’s wall to display all the cards for the rest of the month. 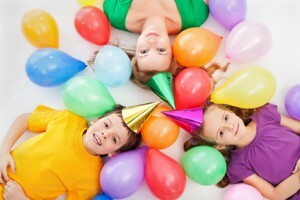 Celebrate by participating in an activity that your family member enjoys. If they enjoy cooking, cook with them and enjoy the meal together. If they like music, make music together. If they like sports, play football with them. Whatever they enjoy, celebrate by enjoying it with them. On Superbowl Weekend make some “superbowl food” and enjoy watching the Superbowl as a family. If you don’t enjoy football, watch the commercials and enjoy time with family and friends. Turn a meal this week into a special celebration by “personalizing” the food-make pancake letters, carve names into the hot dogs, spell out a message with candy hearts, arrange the food on the plate as a smiley face…think of your own creative ideas to “personalize” your meal. Buy some helium balloons-plain ones, heart shaped ones, ones with special sayings- and bring them home just for fun. During a birthday celebration, recall and count blessings the birthday celebrant adds to your family life rather than simply counting the years. Get the “Two in One Inspirational Journal” through Dayspring (http://store.dayspring.com/mrmrinjo.html) and share love notes, romantic messages, or humorous memories with our spouse. Come together to bake a cake, make some cookies, prepare a meal…celebrate one another’s company and enjoy the time together. Turn something ordinary into something special–serve a cup of tea with a ribbon on the cup, have dinner by candlelight, have a special dessert before bed, play a card game while offering a thanks with every turn you take. Be creative and enjoy your time together. Enjoy a movie and a meal. Make the meal related to the movie theme–for instance, superhero sandwiches before a Marvel Movie like “The Green Hornet,” a picnic lunch before “Yogi Bear,” etc. Use your imagination and have fun. Take a hike with your family through a local park or patch of woods. As you go, take pictures of things you see-the interesting, funny, beautiful, or meaningful-and put together a pictorial collage of your hike. Check on-line or pick up a guide to the city/region where you live and find something to do or a place to visit as a family. This weekend, enjoy that place or activity with your family. “Not only does laughter relieve daily tension, but it creates marvelous memories” (Sandra P. Aldrich). Make a point of creating “marvelous memories” by laughing together as a family this week! Get a book of jokes and sit together as a family to read it out loud. Cover all the clocks in your house and spend the evening enjoying one another’s company. You can play games, sing songs, tell stories, go for a walk, dance, or anything else you might enjoy as a family. Get up early and go to a park where you can share a picnic breakfast while watching the sunrise. Then enjoy time playing Frisbee or some other outdoor game. If you are not morning people, take a picnic lunch to watch the sunset–play outdoor games before supper. May 17th is National Cherry Cobbler Day–good reason to share dessert with your family…and celebration. May 18th is International Museum Day. Take a trip to the museum or rent “Night at the Museum” to watch as a family. Families can celebrate together…and such celebration strengthens both families. So, invite another family over this weekend for time together. Share a dozen donuts with your family to celebrate National Donut Day (which is June 3 by the way…and one of my favorite days of the year). National Ice Tea Day is June 10th-celebrate with family by sharing ice tea and conversation…be creative and try mint tea, raspberry tea, sun tea, sweet tea, peach tea, etc. Create a family time capsule and set a date in the future to gather as a family, open it up, and reminisce. Enjoy time as a family celebrating nature-God’s extravagant creation. Keep a blanket, some bottled water, and a small pack of cookies in the car so you can have an impromptu picnic during your travels. Celebrate your children by honoring their play. Have an old fashioned cookout followed by smores.